2019 SEASON MEMBERSHIPS ON SALE NOW! 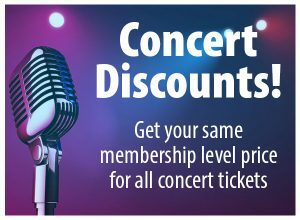 VIP Benefits of being a Member! 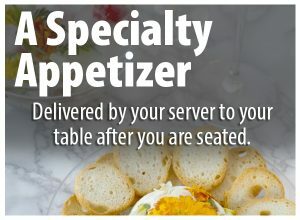 Traditional: Pick your favorite table and dates now to get the best choice of seats. Flex Pass: If you’re just too busy to pick your dates now, this is for you! Pick the shows and choose the dates when you’re ready. 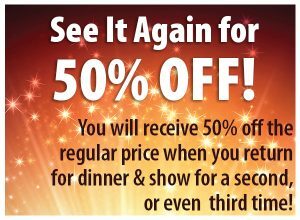 VIP 10% discount off the regularly priced dinner and show ticket for friends and family attending with you. VIP 10% discount in Gift Shop offered only to subscribers. 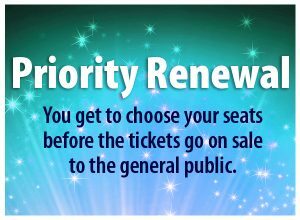 Unlike other subscription packages, you choose ONLY the shows you wish to attend. 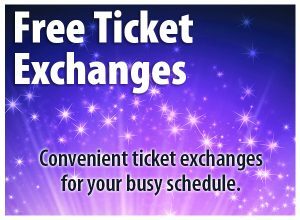 There is no additional charge to change your ticket to another day or to reprint lost tickets. 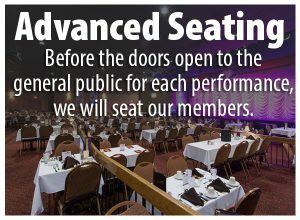 Click the link below to view our Membership Guidelines.